CarGurus has 1,098 nationwide G-Class listings starting at $19,500. Big off-road driving fan? Jeep Wrangler not exclusive enough for you? Have some cash to burn? Check out the Mercedes-Benz G-Class, one of the few niche vehicles that can be said to outfox another super-special niche vehicle, in this case the iconic Wrangler. Although the monster 6-wheel G 63 AMG 6x6 remains unavailable in the U.S. market, 2017 does see the arrival of the G550 4x4², sort of a “little” brother to the 6x6. Essentially, the G550 4x4² offers the 6x6’s off-road capability on a slightly smaller scale, providing an even more rugged addition to the rest of the stateside G-Class lineup. Like the Wrangler, the Mercedes-Benz G-Class has military origins. History has it the vehicle originated in the early 1970s on a suggestion from the Shah of Iran, and it now sees consistent use as a light utility military support vehicle around the world. But Mercedes has also developed the G-Class into a well-established luxury SUV lineup for civilian buyers. The “G” stands for “Gelaendewagen,” which literally means “off-road vehicle,” and each G-Class is hand-built in Graz, Austria, by Magna Steyr, a third party that develops and manufactures vehicles for various automakers (the MINI Countryman and Paceman, for instance, are also Magna Steyr creations). The G550 4x4² begins with a steel ladder frame pieced together with over 6,400 individual welds. All interior cavities in the frame are sealed with hot wax to make it especially water-, snow-, salt-, and sand-repellant, and a robust suspension with adjustable-damping shocks and two stabilizer bars is meant to ensure a smoother ride both on and off road. Perhaps the thing most noticeable about the new 4x4² is its ground clearance, which comes in at 17.2 inches, towering over even the Jeep Wrangler’s 10 inches (9.3 on the G550). This height is made possible by portal axles, which place the axle rods above the wheel hubs, connecting to the hubs through a special gear system. The portal axles also give the G550 4x4² a 51.6-degree approach angle and 43.8-degree departure angle, both also significantly higher than the Wrangler's. All G-Class trims feature standard all-wheel drive, an advanced electronic traction-control system, a transfer case with three locking differentials, and a low-range gear for better off-road motoring. The model has retained the same basic exterior look since first becoming available for consumers in 1979, with only minor changes—yet another characteristic it shares with the Wrangler. 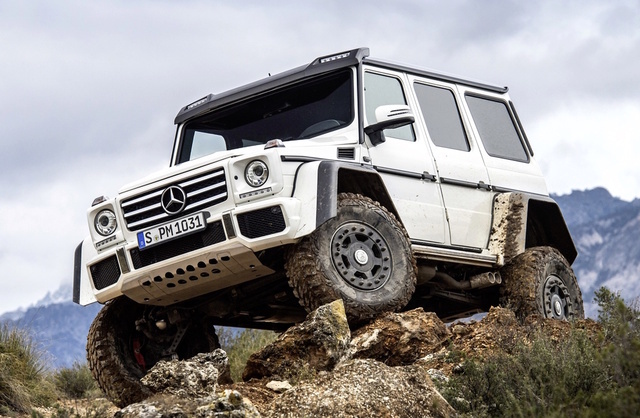 The G550 4x4² features the same biturbo V8 found on the “base” G550 G-Class trim, a 4.0-liter unit that produces 416 hp and 450 lb-ft of torque (quite a lot of off-road grunt compared to the 285 hp and 260 lb-ft from the Wrangler’s V6). There are also two AMG trims, the AMG G63, which uses a 5.5-liter V8 producing 563 hp and 561 lb-ft of torque, and the AMG G65, which contains a 6.0-liter V12 that cranks out 621 hp and 738 lb-ft of torque, significantly more power than you’ll ever need while inching along that sketchy doubletrack dirt road—but on pavement, the AMG G65 can go from 0-60 mph in 5.2 seconds. The G550 trims use a 7-speed automatic, while the AMG trims use a special “Speedshift” version of the 7-speed that is meant to provide quicker shifting response while working with all that extra power. Fuel economy is frankly terrible, at 13 mpg city/14 highway/13 combined for the 2016 G550 trim (though the new 4x4², with its special suspension, will probably get less), 12/14/13 for the AMG G63, and 11/13/12 for the AMG G65. But given the model’s stupendous engine power and rather un-aerodynamic profile, these numbers shouldn’t really come as a surprise. The G-Class comes with the luxury interior you’d expect from a vehicle of its price (never mind that it’s such a capable off-road vehicle as well). All seats are upholstered in leather and both heated and ventilated, a 12-speaker Harman Kardon premium sound system comes standard, and you’ll find Mercedes’ proprietary COMAND infotainment system routed through an 8-inch touchscreen display that’s mounted externally on the dash like the setup in other Mercedes vehicles. An optional rear-seat entertainment system features individual screens on the back of each front headrest. Being the expensive luxury model it is, the G-Class has not been crash tested. It does feature standard safety technologies like a rear-view camera system, blind-spot monitoring, a post-collision safety system, and front and rear parking sensors, along with plenty of airbags. Its relatively large size will likely also make it a bit safer in the event of a collision. Then again, the Wrangler’s not considered a particularly safe vehicle, either. Mercedes-Benz has not yet announced pricing for the 2017 G-Class lineup, including the G550 4x4², which is scheduled to arrive at U.S. dealers by early 2017. Even the 2016 G550 started at almost $120,000—with the AMG G65 offered at an incredible $217,900—so don’t expect any fantastic deals here. This is a truly special vehicle, and an exclusive one as such. What's your take on the 2017 Mercedes-Benz G-Class? Have you driven a 2017 Mercedes-Benz G-Class?